Utah agencies are resettling fewer refugees than ever. What does that mean for those who are already here? 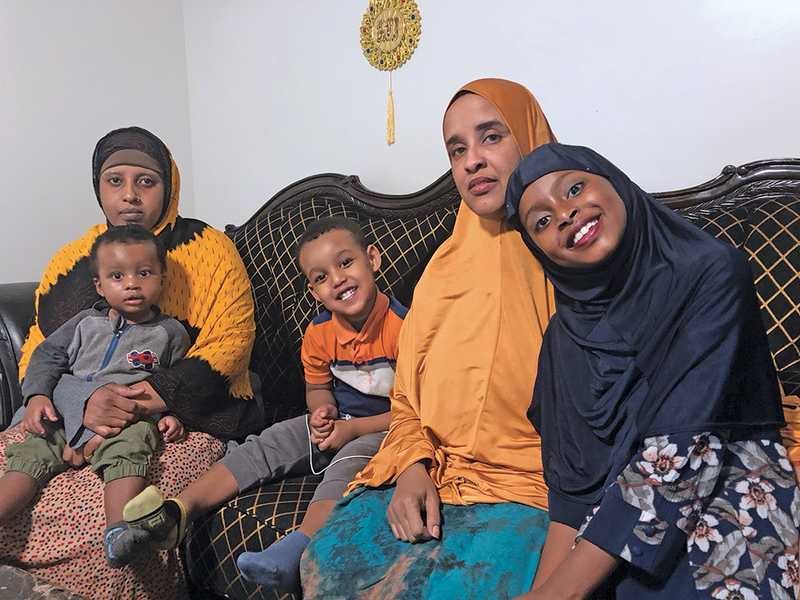 Sadia Osman (second from right) raises a 3-year-old son and spends a lot of time with her cousin and her children, but she misses her boys every day. “We have everything, but we miss part of our lives, like our kids,” she says of refugees resettled in the U.S. So long as she has the money to make the international call, Sadia Osman stays up late every Sunday speaking with her two sons, Ridwana and Fuhad Bana. Her shift at a North Salt Lake manufacturing facility starts before the sun comes up most Mondays, but 10 p.m. Sunday is the best time to ring up her boys, because it's morning in Uganda. Even more special than the telephone talks, is when she saves up the cash for the 12- and 17-year-olds to travel 130 miles from the Nakivale refugee settlement to Kampala, Uganda's capital, where they use the city's Wi-Fi to communicate with their mother over a video feed. A WhatsApp visual chat is the closest Osman has come to laying eyes on her sons in six years. "Most of the time I don't talk to them," she says. "I just cry." Osman is a Somali refugee who moved to New York from Uganda in 2012. She was given permission to come to the U.S., but her ex-husband, the boys' father, was not. He told her they could all leave Uganda together, or they would all stay as a group. Splitting up the family wasn't an option. "In Africa, men have the power," Osman explains. So she left the boys behind. She hasn't seen them in person since. And she's been trying to bring them to the U.S. for half a decade. Ridwana and Fuhad's application to join their mother in Salt Lake City has been approved by multiple federal entities. Now, the fate of their case rests with the American embassy in Uganda, where federal officials will conduct background checks and interviews. Their never-ending wait for a family reunion is a result of President Donald Trump's national security policies. Asha Parekh, director of refugee services for the Utah Department of Workforce Services, says the Trump administration started its "extreme vetting" without adding more staff, so federal workers have to spend more time weighing each person's visa application. But the slowdown means longer waits for displaced persons trying to come to the U.S. The boys are technically Somali refugees, and they are not barred from entering because of Trump's travel ban, as they have a "bona fide relationship" with someone in the country. The more scrupulous screening process is a part of a larger set of policies that is slowing the number of foreign citizens the U.S. admits annually to a trickle. Last month, the Trump administration announced it would resettle a maximum of 30,000 refugees over the following year, the lowest cap in history since President Jimmy Carter signed the Refugee Act of 1980. Utah's two refugee resettlement agencies—Catholic Community Services and the International Rescue Committee—have aided far fewer refugees in the time since Trump took office. The nonprofits resettled a combined 424 people for the 2018 fiscal year, which ended Oct. 1. That's a 65 percent decrease from the number of refugees the agencies resettled in 2016, the last full year under the Obama administration. Studies indicate refugees pay $21,000 more in taxes than what they receive in benefits over their first two decades in the country. But Parekh suggests Utahns lose out on something more intangible than a dollar amount by not having as large of an annual refugee influx. "The more people that welcome and support this group of individuals helps us to be better, bigger people because we're helping people who were in this negative experience," she says. Dipika Dulal says she was the first Nepalese refugee resettled in Utah when she came to the States around 2008. "I thought the only country in the world was Nepal," the 20-year-old says of her wide-eyed first days on U.S. soil. A decade later, she's gone from barely speaking any English to studying business at the University of Utah. Her father, who also resettled in Utah, still sends money back home to people he knows are struggling to make ends meet. "I feel like that's what we should do, just help each other out," she says. "We're just here to better our lives. There's nothing wrong with that." Natalie El-Deiry, acting executive director of the IRC, says the U.S., and particularly Utah, has historically been "a sort of beacon for refugees." But the Trump administration did not resettle the maximum number of refugees it proposed admitting last year, raising questions that it will hit its historically low ceiling over the next 11 months. "We're certainly hopeful this is not the new normal," El-Deiry says. Fewer refugees means less money for CCS and IRC, since each agency's endowment is tied to the number of arrivals they resettle within state borders. "We lost over half of our funding already," Aden Batar, CCS' director of migration and refugee services, says. The IRC laid off five staffers in its 2017 fiscal year, El-Deiry adds. CCS and IRC offer two-year case management services. The organizations help the new Americans integrate into the culture by connecting them with language services and providing them with job training and guidance on career advancement. The goal is to help them become productive members of society. A slashed budget means both agencies have to do more with less, requiring them to provide the same two-year case management with fewer staff members. "We've been extremely conservative in our hiring," El-Deiry says. Numbers and budgetary realities are helpful for context, but they make abstract how much pain these policies can cause. Real people like Osman are the ones affected by Trump's "America First" chest-thumping. "There are thousands of cases like Sadia's children who are in limbo," Batar says. Ridwana and Fuhad dominate Osman's thoughts every day. When she wakes up, they're there. When she eats, they're there. When she gets home from work, they're there. A phone line and a video connection don't make it any easier for Osman to watch her boys grow up from the other side of the world. Osman says she has a good life here. She has a job and drives a car, perks she says she didn't have before. She's made Salt Lake City a home, but she still sees her boys everywhere she looks, an agonizing reminder that a part of her is still in Uganda. "To have my kids away from me makes me crazy," she says.